Including the pair of antennas on top, Spin Master’s BB-8 actually comes closer to 19-inches tall. So fans of The Force Awakens who were hoping to have their own droid sidekick, but were disappointed with the tiny version that Sphero revealed, might finally find what they’re looking for here. A handheld remote that looks similar to a Nintendo Wiimote, but with an analog joystick on one end, is used to remotely control and steer BB-8 around. But Spin Master realized that Star Wars fans have always wanted to talk to their droids just like Luke, Rey, and Poe do, so its BB-8 is the first to include voice recognition. Unfortunately if this looks like the BB-8 toy for you, you’ve got a bit of a wait ahead of you. Spin Master won’t be releasing its droid sidekick until sometime in the fall later this year. 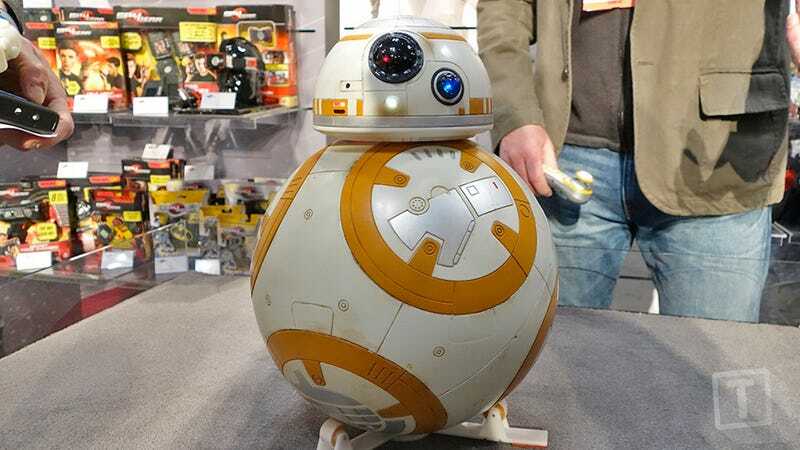 And because of all the wonderful technology packed inside, including lights and authentic sound effects from the movie, it will come with a $180 price tag making it slightly more expensive than Sphero’s offering. So it’s another pricey collectible for Star Wars fans, but if it works as promised, it sounds like a pretty great addition to a collection.